Wet vs. Dry Concrete Polishing: What's the difference? Although you can polish concrete floors or countertops using either wet or dry methods (see Wet vs. Dry Concrete Polishing), the trend today is to go dry. Not only is this method faster and more convenient, it doesn’t leave behind the messy slurry that wet polishing creates. Polishing dry, however, does generate a lot of dust, which makes the use of dust-control equipment mandatory to keep the concrete fines from going airborne. Safety and air quality are the main purposes for dust-collection systems, but keeping enough dust off the floor so that contractors can see the scratch pattern as they grind is also important, says Clark Branum of Diamatic USA. 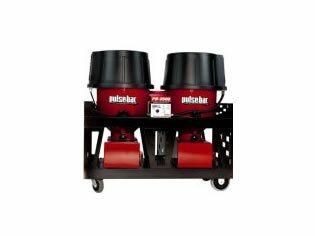 Most grinders for polishing concrete floors don’t come equipped with an integral dust collection system, which means you’ll have to purchase a separate unit. 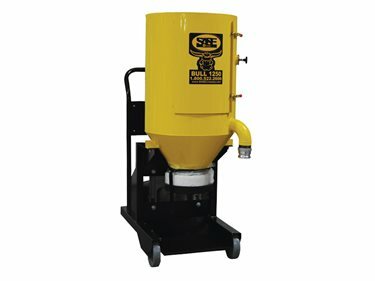 Some manufacturers will sell dust extractors specifically for use with their machines. But if that’s not the case, you’ll have to shop around on your own. Here are some tips from Branum for the key features to look for. How is the dust collected?How the dust is collected -- in a tank or in a bag - is a consideration when it comes to disposal. Branum says the Longopac (a continuous bag system) is the most convenient for clean one-step disposal vs. a standard dust tank, which will require you to empty and dispose of the contents separately. However, if you prefer to go with a dust tank, he recommends a capacity of no more than 50 pounds for floor polishing applications to allow for easier disposal. A larger tank will become too heavy for one person to empty. 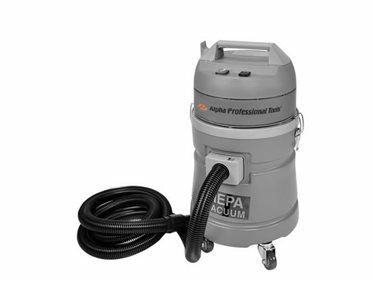 A countertop vacuum from Alpha Professional Tools. 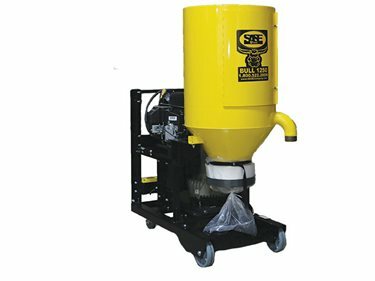 Handheld grinders for concrete countertops will generally come with a dust-collection bag and a shroud surrounding the cup-wheel to suction the airborne dust created during the grinding process. The dust that is collected can then be disposed of separately. What type of filtering system does it use?Most dust extractors have the capacity of capturing 99% of any airborne dust particulate. But you should also look at the type of filtering system the machine uses. Branum says that HEPA-type (high-efficiency particulate air) filters are being specified more often than in the past, and certain projects require the use of HEPA filters exclusively. Most manufacturers offer HEPA filters as options for their systems. Regardless of the filter type, look for a filter housing that’s readily accessible so the filter will be easy to replace. 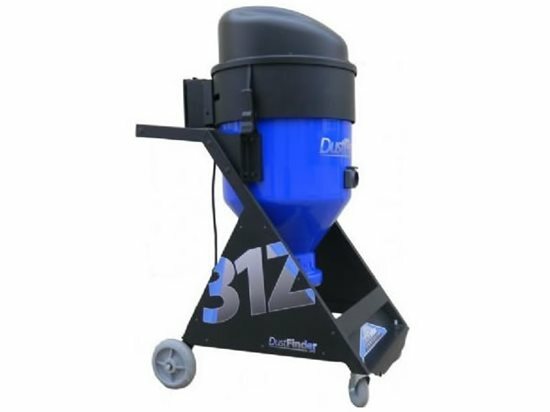 Lavina’s DustFinder DF31z Concrete Vacuum system. What are the power requirements?The power requirements of the dust collector are another important consideration. Often it’s good practice to match the voltage of the collector to the grinder being used, says Branum. “Some machines run on 230-volt three-phase, while others run on 480-volt three-phase power. It's smart to run all of your equipment at the same voltage so problems are less likely to occur in the field,” he says. Some manufacturers offer power-pass through options so the contractor can run his grinder directly from the vacuum. This eliminates having to run two separate power cables a long distance. How efficient is the machine?The airflow rate of the dust collector, measured in cubic feet per minute (CFM), is a good gauge of its efficiency. A high CFM rating is definitely a plus, according to Branum. These rates will vary, depending on the size of the machine, with larger units providing greater airflow capacities. “Large production machines generate a lot of dust, so the CFM of the system has to be able to keep up. Smaller grinders and polishers can have lower CFM airflows. Some manufacturers rate their systems with a 2-inch hose connection and some with a 3-inch connection, so it really depends on the demand of the grinding equipment. A high CFM allows you to run longer hose lengths and still have effective dust collection,” he says. Get an overview of the different types of dust control equipment. Dustless grinder demonstration for concrete contractors. Planetary Grinders by SASE Low maintenance, ergonomic design, perfectly balanced low profile grinders. GranQuartz Great Deals! Up to 60% off products you use everyday! Klindex Hercules 451 For use with both polishing and floor prep. Compact Grinding Machine Easy to transport, 100% trackless and gets to less than 1/8" of the edge.